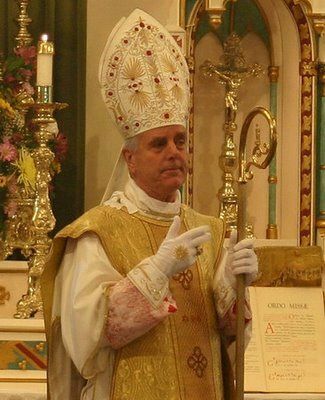 Bishop Richard Williamson will be conducting Mass and presiding over a conference on the “Crisis of Tradition” in Brewster, NY, on April 1. The focus will be on “the ramifications of the gradual movement of Tradition towards Modernist Rome.” Brewster is about an hour north of NYC. On April 2, Bishop Williamson will conduct a Mass and another conference somewhere in NJ. These visits appear to be sponsored by Our Lady of Mount Carmel Church, in Boston, KY.
Over the past several months, Bishop Williamson has made many visits to traditionalist chapels scattered across the US and Canada. He has also reaffirmed his Holocaust denial. More on the latter in a future post. This entry was posted in Holocaust denial, Richard Williamson, SSPX, Traditionalist Catholicism. Bookmark the permalink. Let’s not forget the U.S. government’s suppression of knowledge about widespread genocide that our presence has inflicted on the people of the Middle East. Williamson influences small numbers of people and he does not run foreign policy. How many children around the world will ever hear the truth? : that Pius XII instructed the Catholic Church to save thousands of potential victims of the Holocaust. Israel Zolli, then Chief Rabbi of Rome, converted to Catholicism after he was hidden by two Italian families. Yes, traditional Catholicism is the scourge of the earth. Let it be wiped out so that a post-Christian pagan world can reintroduce the glory of slavery in a high-tech, world-wide police state. How is it possible to deny that of which could not possibly happen? In this matter of concern, I believe the only place for where a denial can be found, is in the assertion of that which has never happened. If all the jews were to perish tomorrow, Satan would have to elect a new group of disciples today.